I think thousands of people must have read this quote last Sunday and headed to my favorite Virginia state park, Grayson Highlands. The parking lots were all packed on a beautiful Sunday afternoon, so we just set up camp and hiked out the short trail to Big and Little Pinnacles, hoping the crowds would die down for our longer hike on Monday. 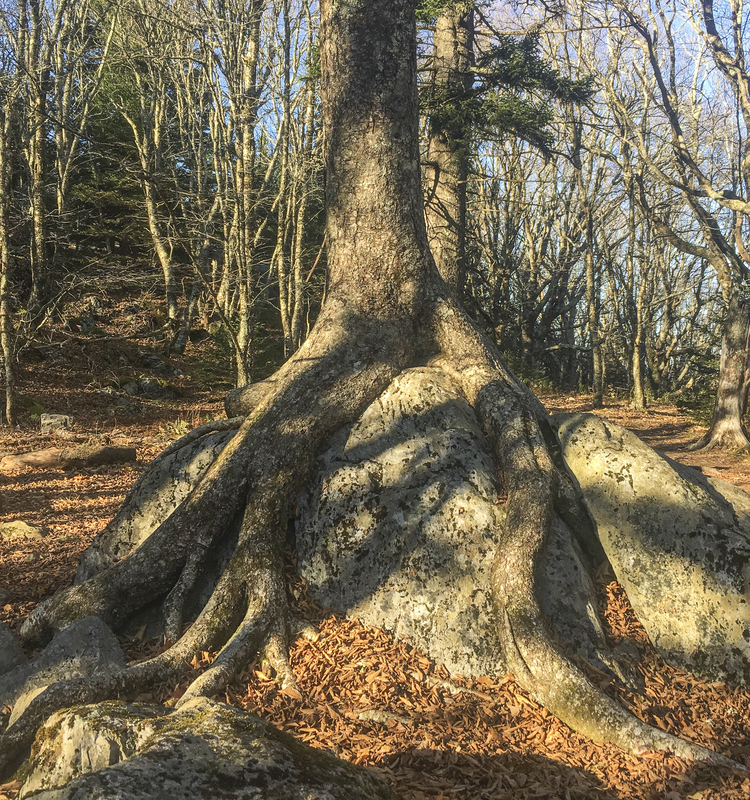 including one of my all-time favorite trees – a birch that embraces a boulder just down the trail off the Little Pinnacle. 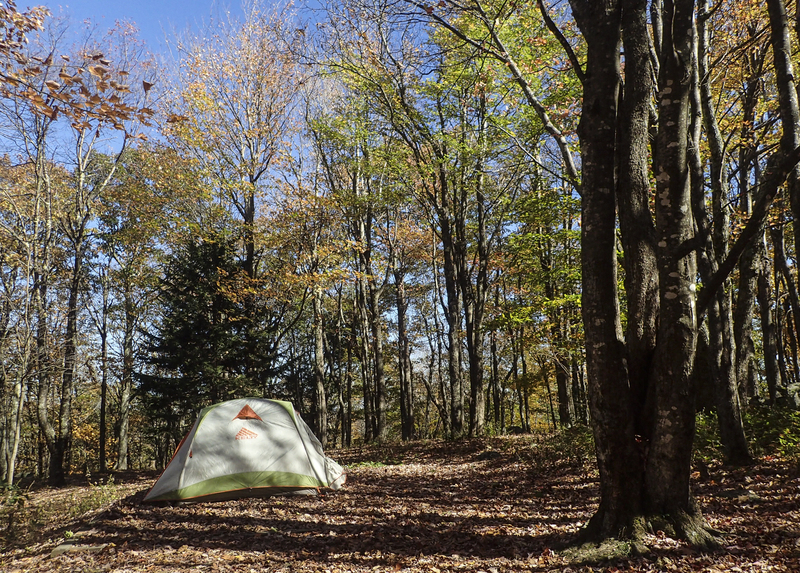 After a blustery night in the campground, we headed up to a now almost deserted parking lot at Massie Gap on Monday morning. I have been going up to this area for as long as I can remember, visiting my grandparents and my Aunt Ruth every summer when I was a kid. I fondly remember climbing over the boulders and picking (and eating) the sweet huckleberries that are so abundant in late summer. I have been back many times since, but usually for short visits or just a night of camping. Melissa and her sister backpacked the area two weeks ago and proclaimed it the best hiking in the region (the area was named one of the top ten hiking areas in America in a Backpacker Magazine article in 2011), so we decided to go back and take in some of the many miles of trails that crisscross this mountain paradise. Our route would take us roughly along the trails that Melissa had walked two weeks ago, but, since we were doing it in a single day instead of two, we took a few shortcuts, making our total hike about 10 miles. 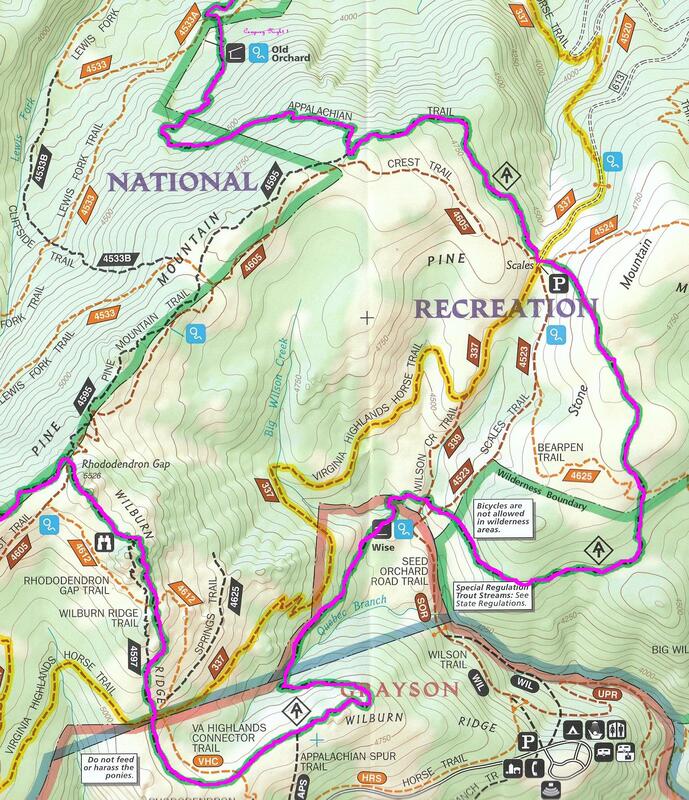 Our route took us from Massie Gap (just off bottom center of map) up to the Appalachian Trail (AT, purple line). We hiked northeast to the Wise shelter; then took the Scales Trail (dark red dashed line) to Scales; the Crest Trail northwest to its juncture with the Pine Mountain Trail (black dashed line); Pine Mountain Trail southwest to Rhododendron Gap; then the Wilburn Ridge Trail south and back to Massie Gap. 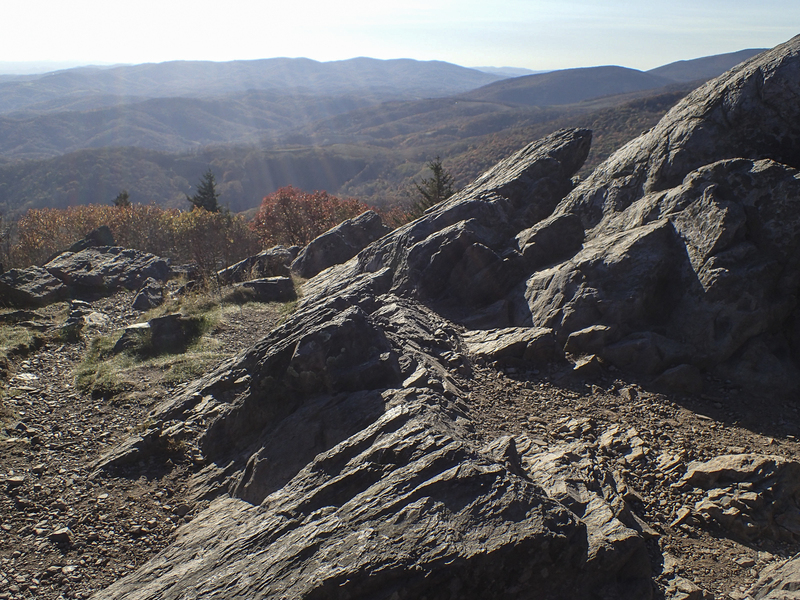 The weather was perfect as we started our hike up from the popular starting point at Massie Gap, although the wind was pretty strong, with gusts approaching 20+mph on occasion. The views in this area are spectacular and the terrain reminds me of being out West, with big Montana-like skies, and a mix of conifers, open meadows and huge rock outcrops. 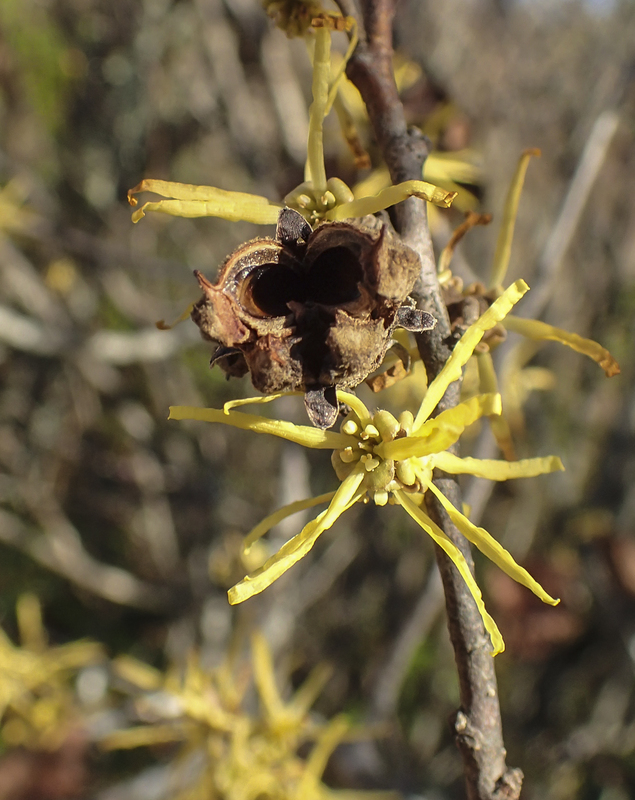 All along the lower pars of the trail, we saw the odd-looking late blooms of witch hazel, Hamamelis virginiana. 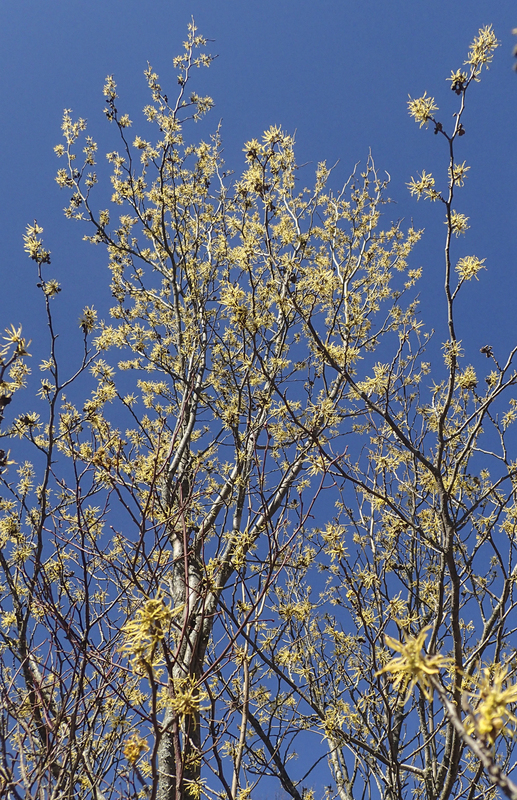 The flowers are much more noticeable on trees that already had lost their leaves. This widespread shrub/small tree blooms later than almost all other plants in the region and, surprisingly, relies on whatever insects may still be active for pollination. The genus name, Hamamelis, means “together with fruit”, since this year’s flowers occur simultaneously with the ripening fruit from last year. Fruit capsule splits explosively with an audible pop, ejecting the seeds up to several feet. 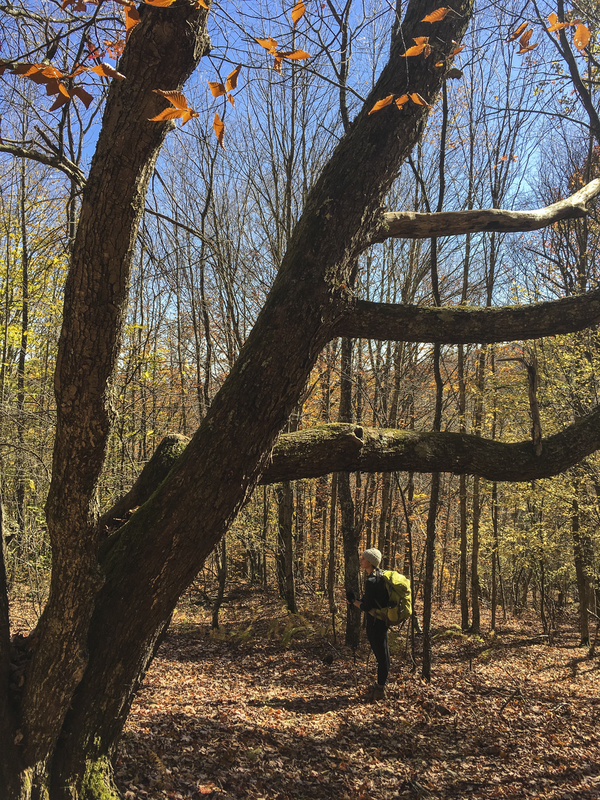 We appreciated the times the trail traversed through the trees, sharing the beauty of the forest, and giving us a break from the winds. 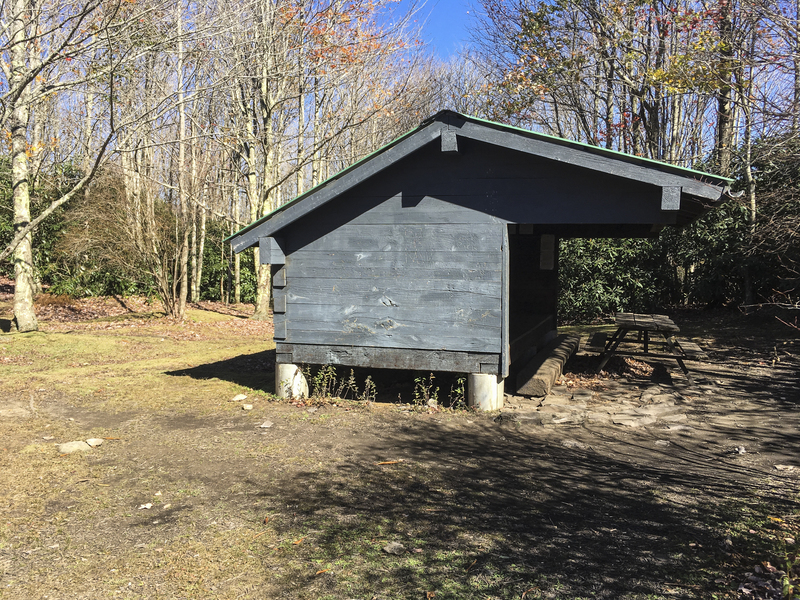 I was impressed by the Wise shelter on the AT – a nice structure in a beautiful setting next to a creek. 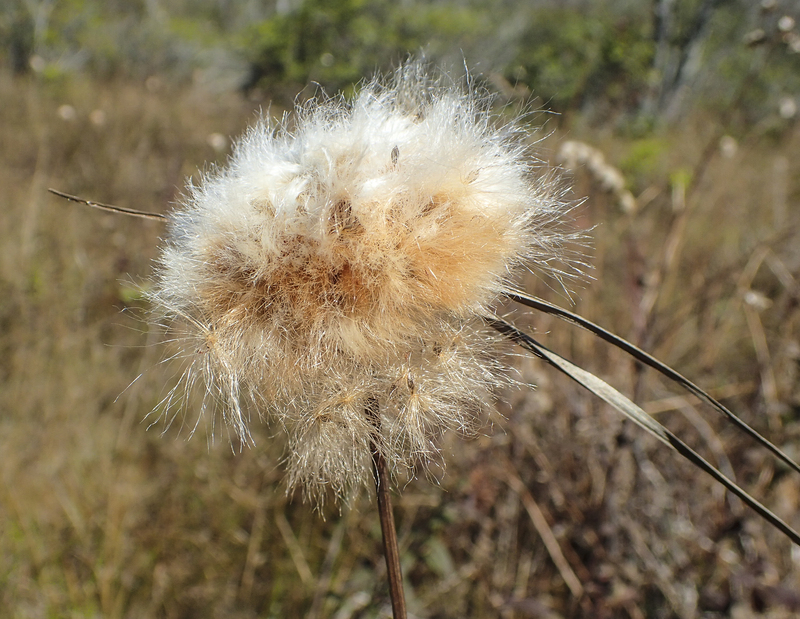 Near the Wise shelter and all along the Scales Trail, we saw seed heads of cotton grass, Eriophorum virginicum. This is one of several species found in the scattered mountain bogs in the area. 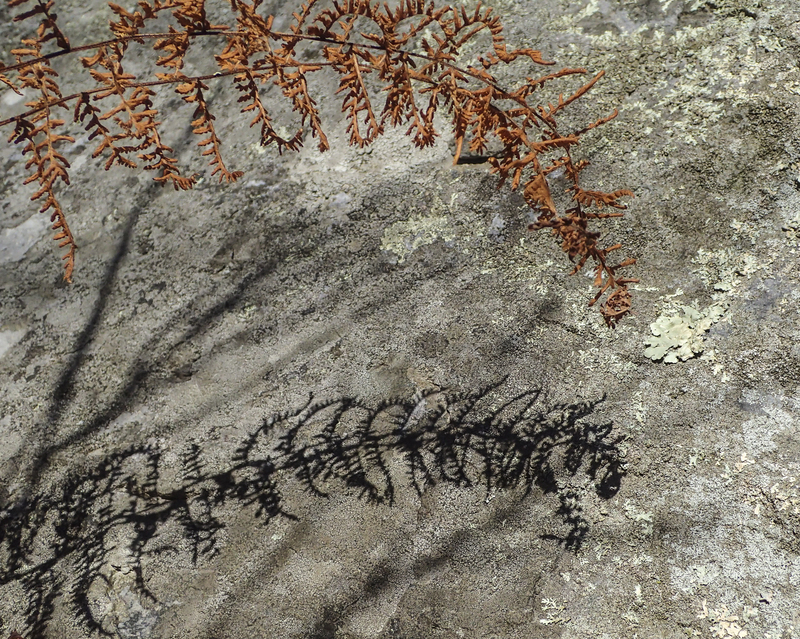 I definitely want to come back in the spring and see what interesting wildflowers may occur in them. 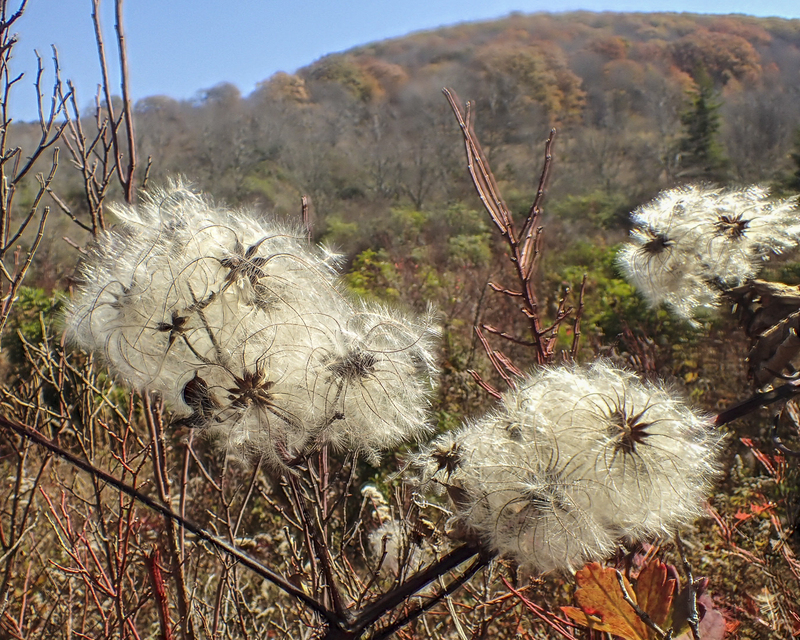 From a distance, the seed puffs of virgin’s bower, Clematis virginiana, look a little like the round seed heads of cotton grass. 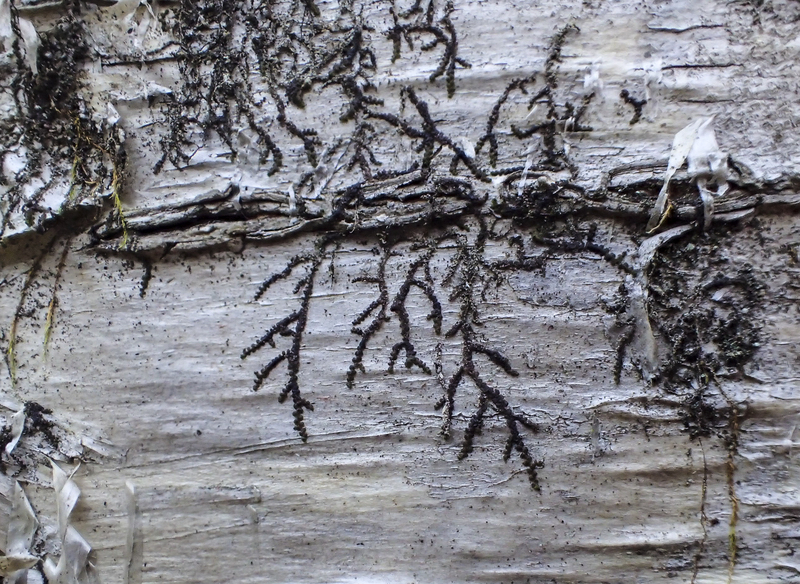 But, close-up, they are a light, feathery head of white “hairs” that occur in groupings along a twisting vine. This is a native Clematis with male and female flowers on separate plants. The combination of wind and sun made for an interesting hike in terms of temperatures – cold in the wind, warm when protected from it. We saw several species of butterflies out and about including buckeyes, commas, and American coppers. Bird life included crows, ravens, a red-tailed hawk, and lots of robins and juncos. We hiked a few miles with only distant glimpses of probably the most famous inhabitants of these mountains, the wild ponies, but that would soon change. 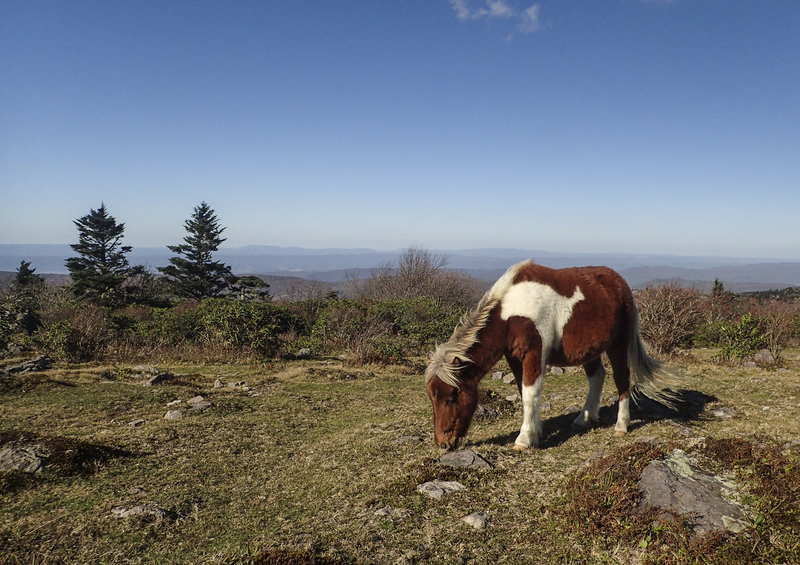 Various online sources state the ponies were released into these highlands by the U.S. Forest Service around 1975. 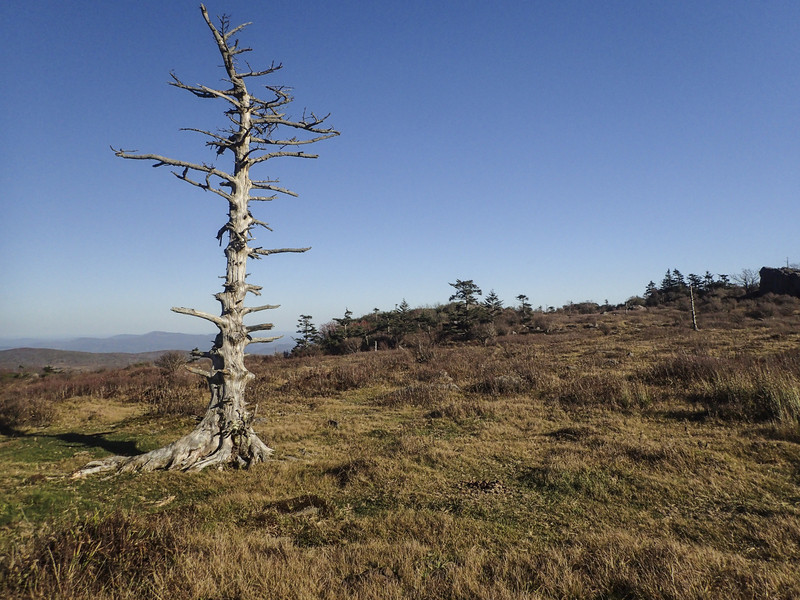 The purpose was to control the growth of shrubs in the balds of the high country. The balds formed in the late 1800’s after extensive logging and fires. Cattle grazing kept the areas open until the creation of the park in the mid-1960’s. The pony herd has grown to over a hundred animals and is now maintained by periodic round-ups and auctions of excess colts. 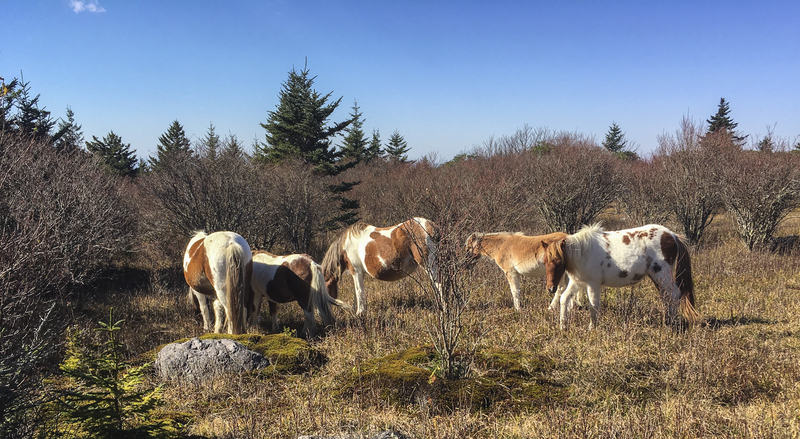 We came across more of the herd grazing in a meadow along the Pine Mountain Trail. 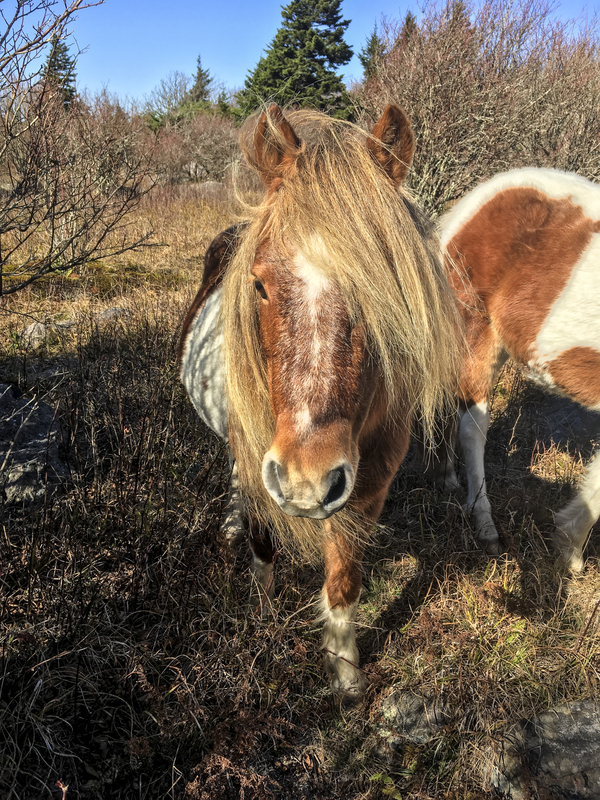 Park regulations prohibit feeding or petting of the ponies, but don’t mention what to do when they start following you, as a couple of them did to us as we passed along the trail. They seem friendly enough (although park signs warn that they may to bite and kick) and certainly are beautiful, but I have read a few accounts online about some being pests at backpacker campsites. But these just seemed curious about us (probably hoping for a handout) and we soon left them to their grazing. 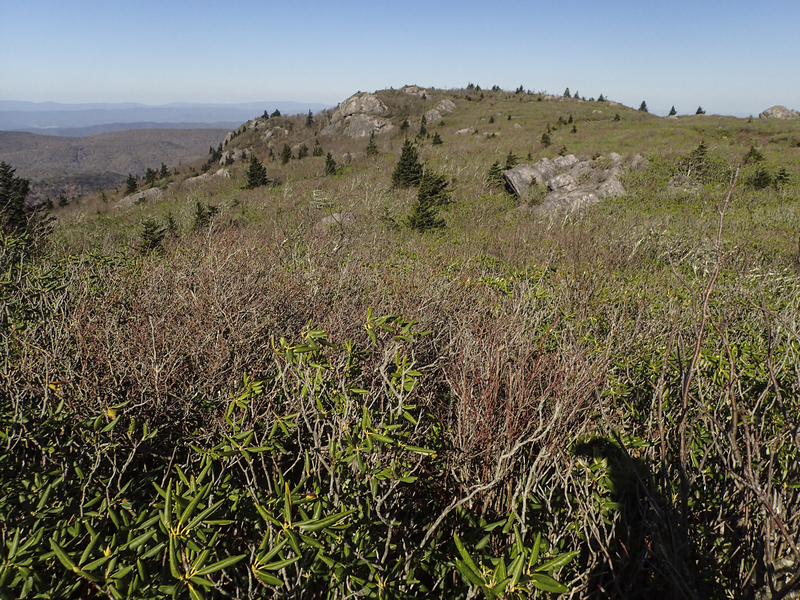 Several trails converge at Rhododendron Gap, a saddle in the mountain ridge that is covered in its namesake flowering shrub. Looks like a place we certainly want to visit in June when the display is at its peak. 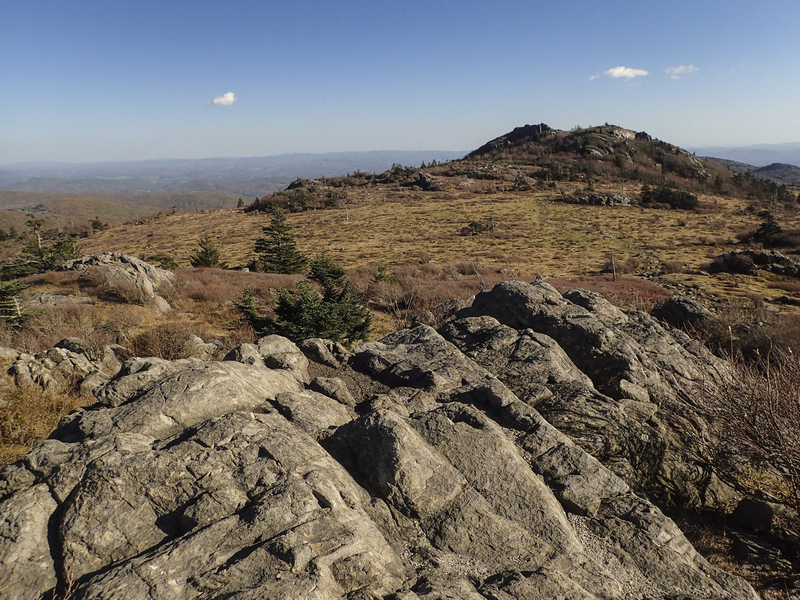 The trail up Wilburn Ridge is a bit of a rocky scramble, but the views are amazing once you break out into the open. 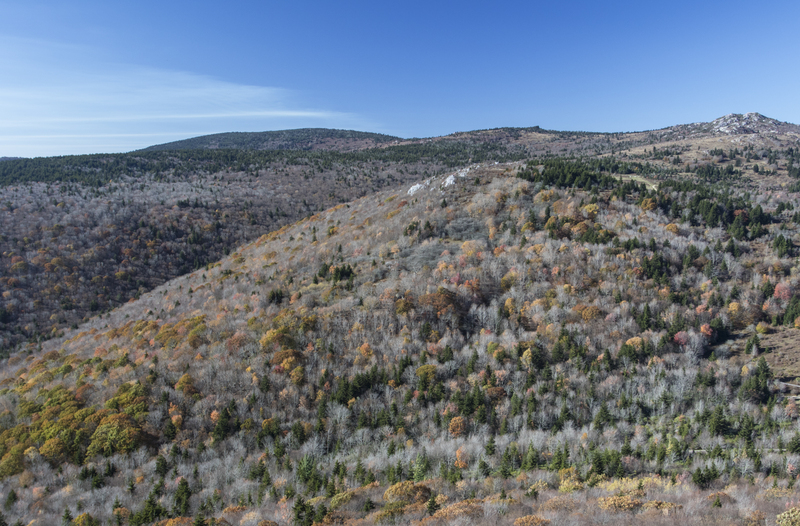 The ridge is named for Wilburn Waters, a famous hunter and trapper that called these highlands home in the mid-1800’s. Rumors have it some relatives said my Dad, in his youth, was like Wilburn, for his tendency to be out roaming these mountains in pursuit of fish and game. Who knows, maybe that’s one more reason I find these rocky balds so appealing. 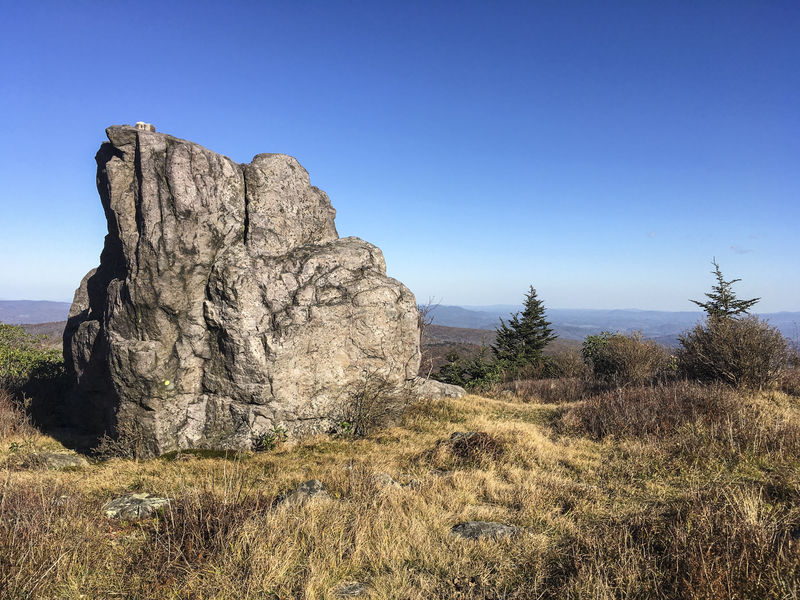 The highest peak in Virginia, Mount Rogers, rises nearby and, on a clear day, you can see far into North Carolina with views of iconic peaks like Roan Mountain and Grandfather Mountain on the horizon. After climbing off the highest rock outcrop (where the wind was blowing a steady 15+ mph), Melissa took me to the campsite she and her sister shard on their recent backpacking trip. What a view it must be of both sunrise and sunset, with rolling ridges of blue as far as the eye can see. We will be back on another trip I am sure, most likely backpacking next time, and, hopefully, when the winds are not as gusty. 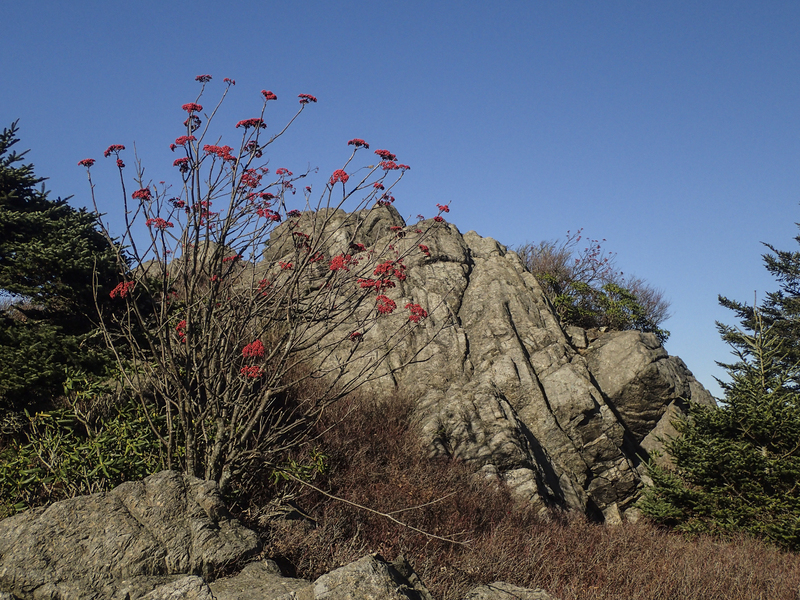 The elevation on Wilburn Ridge is somewhere around 5500 feet, but the rock outcrops and balds make it seem much higher. 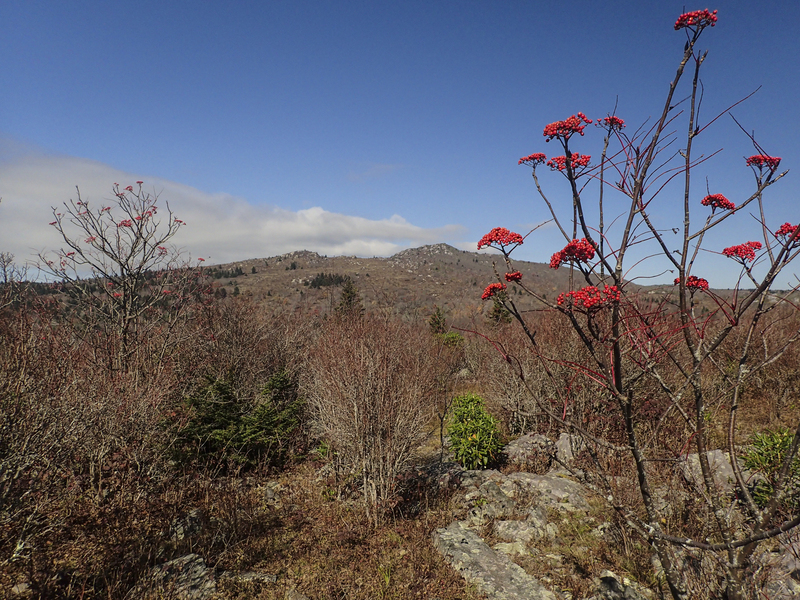 The fall colors were past peak on our hike, but the palette was still beautiful with shades of brown, the grays of boulders, the dark greens of spruce and fir, and the bright red berries of mountain ash against a brilliant blue sky. 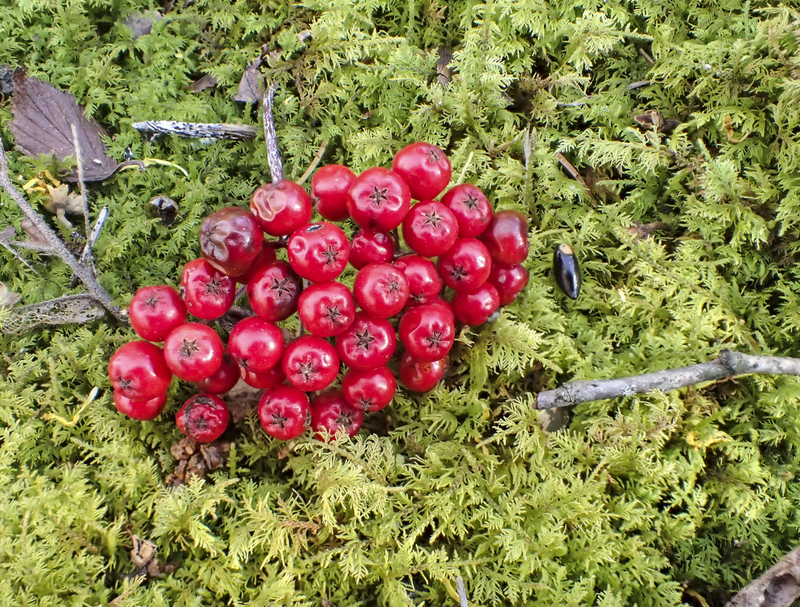 American mountain ash, Sorbus americana, is not related to ash trees, but is a member of the rose family, containing trees such as apples and cherries. The berry-like pomes can remain on the trees much of the winter and are a favorite food of birds such as robins and cedar waxwings. 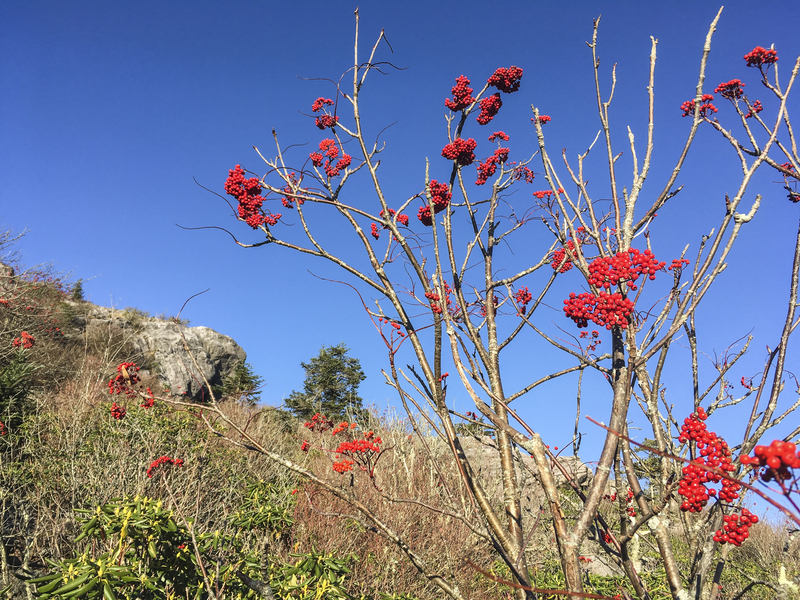 Whether lying along the trail or swaying in the winds at the tips of branches, the bright red-orange fruit of the mountain ash are emblematic of the high country and brisk mountain air this time of year. We wrapped up our hike about 6 pm and headed back to our campsite. The wind was starting to die down a little, the temperatures were dropping, and our bodies felt that good sort of tiredness that comes from spending a day hiking these hills. It was a great reminder that you don’t have to travel to the far corners of the globe to experience natural wonders and fantastic vistas. They can be found in the memories of childhood not far from home. 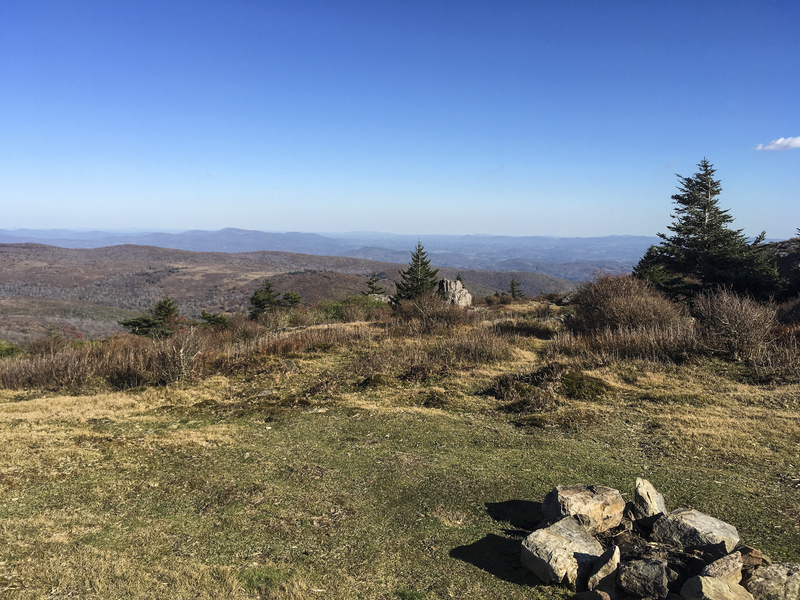 This entry was posted in Trip report and tagged grayson highlands state park, mount rogers, mountains by roadsendnaturalist. Bookmark the permalink.